Adam returns to the world of the Living Dead but finds things not as they were. The Scream Factory Blu-ray of Return of the Living Dead Part II comes loaded to bare with an impressive transfer and a literal military convoy full of special features. Horror and comedy are strange but potent bedfellows. Many attempt but few succeed at concocting a film of this heady brew. Return of the Living Dead is one of the precious few that managed to tow that line perfectly. It’s unfortunate that its “sequel” does not live up to the original predecessor, though manages to be its best an entertaining diversion. 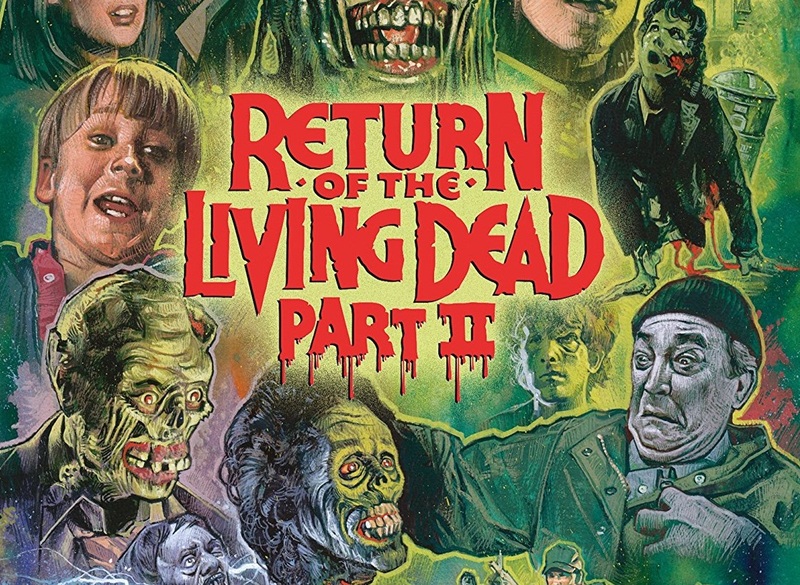 The primary issue with the sequel is for all intents and purposes Return of the Living Dead Part II is a remake of the original. Unlike, Evil Dead 2: Dead by Dawn, this sequel does not bring any sort of kinetic energy or brilliant comedic or horror set pieces. Writer/director Ken Wiederhorn creates a film skewed heavily into the comedy and goofy. The film’s basic plot of toxic waste that turns people into the brain craving living dead being released into a small town is beat-for-beat a rehash of the original. Wiederhorn took everything special about the Dan O’Bannon original and flattened it to the point of mundanity, bringing no original ideas, characters or concept to his movie. There are a few bright spots within the runtime. James Karen and Thom Mathews are back from the original, playing the exact same roles, albeit with different names. Their buffoonery is a well-oiled machine no clunky script could stop. Also of note, Dana Ashbrook (Bobby of both iterations of Twin Peaks) as the younger lead does well with the “hero” role and shows even in the 80’s he was vastly underutilized. The main attraction is the zombies and for the most part, the makeup FX work is stellar. The problem is Wiederhorn’s script and direction never make them funny and terrifying in equal measure. O’Bannon’s original had the perfect balance of humor with the zombies and truly horrifying and disgusting moments. Here the FX work just goes to waste in favor of a Michael Jackson zombie doing the moonwalk. Return of the Living Dead Part II is ultimately a disappointment. Watching the finished product one see everything left vacant by Dan O’Bannon’s departure: the passion, the humor, the intelligence, the horror. All of it missing and nowhere to be found in the film that Wiederhorn said he hoped would become “The Police Academy of Zombie Films”. I will leave you with that faithful reader and no more. Regardless of my thoughts on the success of the film, the new 2K Scan from the interpositive looks great, showing off the work of famed of then relatively unknown cinematographer Robert Elswit. Regardless of my thoughts on the film Scream Factory has amassed an impressive assortment of thoughtful special features that actually address the criticisms I had. Rarely do I see special features address the critical failure of a film and what specifically went wrong. A huge round of applause to Scream Factory, MGM, and the disc producers for going this very thoughtful and interesting route with the production of these special features. The set begins with three audio commentaries. Yes, that’s right: three audio commentaries. The archival commentary features Wiederhorn and actor Thor Van Lingen. This is a standard conversational commentary with Wiederhorn and Van Lingen doing more casual production anecdotes more than anything else. The first newly recorded commentary by Suzanne Synder is similar to the Wiederhorn and Van Lingen commentary, casual production anecdotes. The best of the three commentaries is the last of the newly recorded ones with critic Gary Smart and filmmaker Christopher Griffiths. Both are fans of the film but Smart having, literally, written the book on the Return of the Living Dead series is the key to this commentary as both men discuss the sequel(s) and original in detail. It’s a lively commentary. Back To The Dead: The Effects Of “Return Of The Living Dead Part II is a 25-minute featurette exploring the work done by Kenny Myers. The documentary is fascinating because none of the participants hold back on their dislike for the finished product. Myers particularly details the years of anger at this production and how tonally wrongheaded he felt it was. It’s a great piece because of the honesty of all participants. The Laughing Dead is an 18-minute interview with writer/director Wiederhorn. The interview is interesting because Wiederhorn, whether he realizes it or not, accounts for the film’s issues. The director admits to what Myers said in two other featurettes on the disc, that he “hates horror” and wanted a “goofier” tone. Even now people will be surprised the director has no concept of what made the first film so great. Undead Melodies is a 12-minute interview with Studio Session Keyboardist turned composer J. Peter Robinson where he discusses his work on the sequel and how quickly it came together. The interview with Actor Troy Fromin amounts to 2 minutes discussing how he got the role of “Pot Smoking Army Truck Driver”. They Won’t Stay Dead: A Look At Return Of The Living Dead Part II is a 30-minute making-of documentary and possibly the crown jewel of the set. This doc doesn’t hold anything back regarding the troubles with the production and also with the film itself. All major parties (with exception of Dana Ashbrook) participate in the featurette. From Dan O’Bannon’s involvement (which was none) to the goofy tone to the Michael Jackson Zombie, to the lack of gore. All is covered and with a fair amount of honesty. This making-of makes for a more compelling watch than some of the film because of how much truth is being told. Great-great-great documentary and worth the price of admission alone. Live From The Set is a stilted goofy and kitschy 5-minute archival featurette where a real news crew is playing up the zombie-ness of it all during a set visit. It’s a harmless doofy fun. Half will love this. Half will roll their eyes. I will say one thing that is hidden within this featurette is the wrongheaded assessment by Wiederhorn and points to the primary issue with this film. Wiederhorn states that he wants to make “the police academy of zombie films”. There you have it. The Archival Interviews With Ken Wiederhorn, James Karen, Thom Matthews, and Kenny Myers are about 4-minutes long and are more sound-bites from an EPK than fully formed interviews. The Behind-the-scenes Footage is about 4-minutes of B-roll footage and like many of the Scream Factory disc are some of the more interesting features on the disc as the footage has plenty of the FX work. The vintage Trailers and TV spots are appropriately 80’s as they are voiced by Don Lafontaine aka THE TRAILER GUY. Rounding out the set are a pair of Behind-The-Scenes Still Galleries. For fans of Return of the Living Dead Part II, this is your golden goose. Great transfer, bountiful extra features, what’s not to like? For non-fans, this Scream Factory set is still a curiosity as the special features do enlighten one on what exactly went wrong with a sequel to such a beloved film. Recommended with forewarning for non-fans.